Are you looking for a wedding guest book that uniquely represents you, one that will be a cherished part of your family history? Do you want a guest book that is a collection of cherished memories rather than a list of names? You have found what you are looking for with a Petal Press handmade guest book. The Petal Press can provide you with a customized vellum overlay page behind which you can place your favorite photo. This vellum will contain your names, wedding date and any special quote or saying that you would like to add (see below). 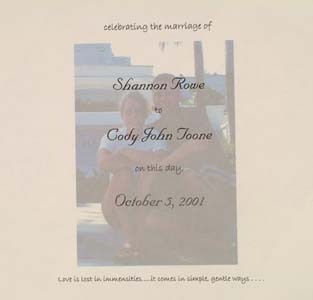 The page can match your wedding invitation in wording or be entirely different. It can be as formal or casual as you would like....whatever represents you best. Customized vellums are available in the medium and large size albums only. If you need ideas for a quote, please see below. When you are ready to order, go to the order page. We are always happy to help you design an album that is uniquely "you". If you would like a quote on your personalized vellum, here are some ideas. Please feel free to choose one of these or use one of your own. "Love is lost in immensities....it comes in simple, gentle ways." "Marriage...the beautiful blending of two lives, two loves, two hearts..."
"This day I will marry my friend....the one I laugh with, live for, dream with.....love." "I tell you I love you every day for fear that tomorrow isn't another." "Love knows no limit to its endurance, no end to its trust.